Stunning Portofino and Cinque Terre offer the best coastal hiking in the Mediterranean. The cluster of seaside villages known as Cinque Terre (Five Lands) burst onto the active travel scene no more than 15 years ago and has become one of the most visited destinations in Italy. All villages were built on the same principle, with a castle erected on top of the mountain by the feudal families who originally ruled over the Cinque Terre and which served to defend the village against the Saracen invaders and pirates coming from the sea. Lack of open space created the characteristic tall, narrow houses. Cinque Terre has some of the best coastal hiking in all of Mediterranean and UNESCO recognized its beauty and uniqueness in 1997, listing it in the registry of World Heritage Sites. But don't expect large crowds and souvenir shops. 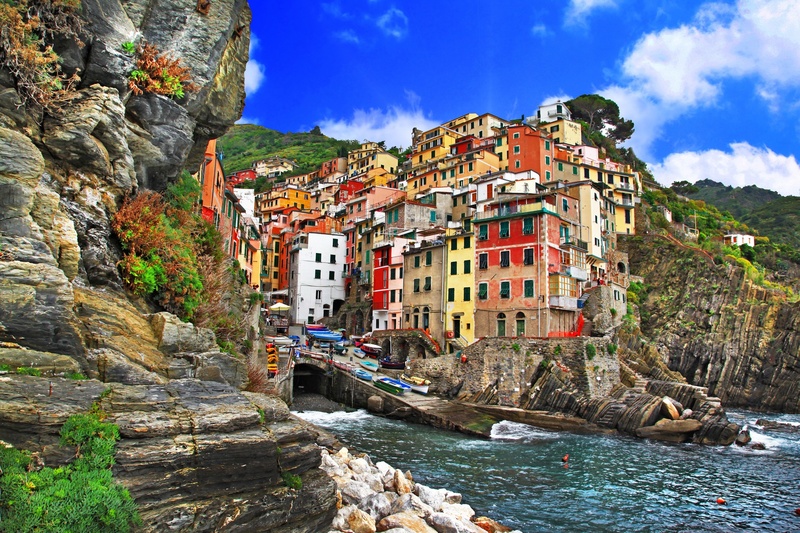 Cinque Terre has managed to maintain its authenticity despite its popularity, and Tourissimo will take you behind the scenes and off the beaten path in many of the villages and places we visit. 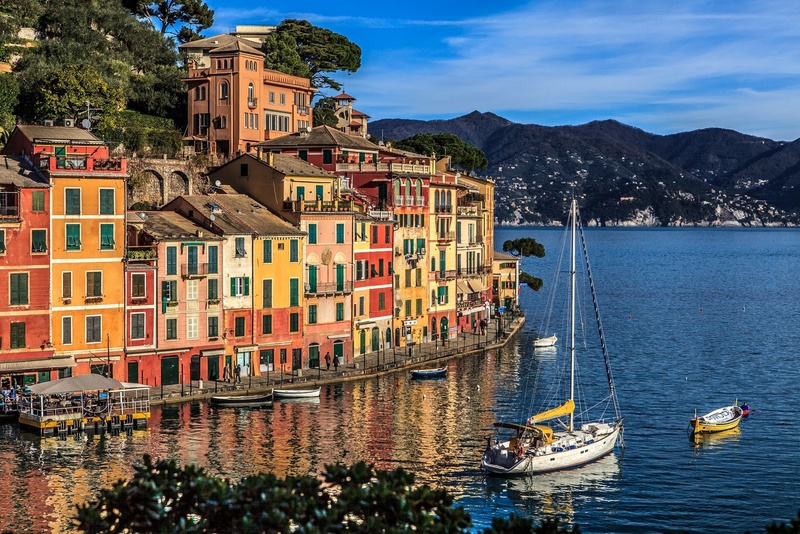 The tour also includes Portofino, which is not part of Cinque Terre but is worth the visit for its picturesque harbor and interesting history. Colorful, timeless fishing villages dot our hikes among olive trees, vineyards and fragrant flowers. 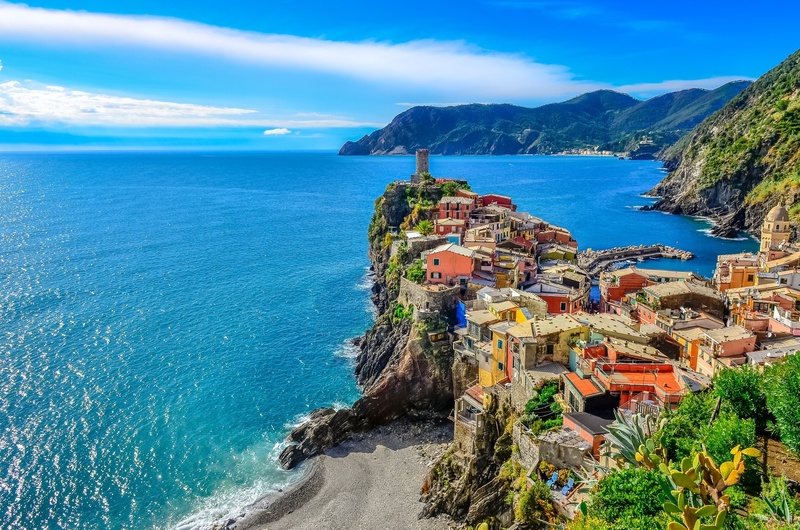 Cinque Terre is also a great destination for lovers of food and wine, a place where farmers have been battling with the steep terrain for hundreds of years, creating small patches of cultivable land on terraces held up by dry stone walls. Down below, a deep blue sea and crashing waves will leave you in awe with each step. Your guide will meet you at the Malpensa Airport (Milan) for a transfer to Santa Margherita Ligure. After checking in at our hotel we will make our way to Portofino's picturesque waterfront, home of the rich and famous, where you can do some shopping or enjoy a gelato with a view. We will gather just before dinner for an overview of the tour while holding a glass of local white wine to welcome the week ahead. Today’s hike through the Parco Naturale Regionale di Portofino is not technically part of Cinque Terre but offers equally spectacular coastal hiking with views of quaint fishing harbors on quiet trails with few people. We’ll visit the San Fruttuoso Abbey, located on the shores of a deep-set cove and only reachable by boat or on foot. After lunch we’ll take a boat to Camogli, a quiet, colorful fishing village. Along the way we will introduce you to a local specialty: the focaccia Ligure, the often imitated local flatbread that is one of the signature dishes of the region, and perhaps, the best trail food you’ll ever come across! 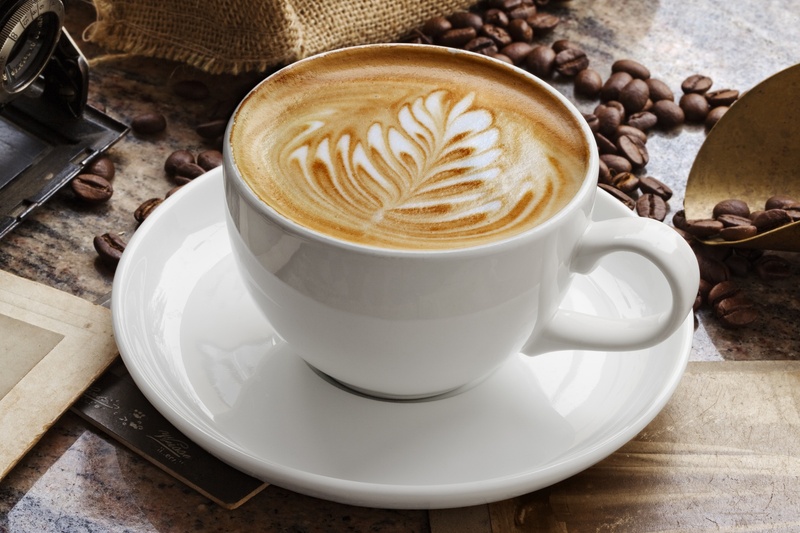 And, don’t forget to have a cappuccino in each village you are hiking. You deserve it! We will start our hike this morning in Levanto, the gateway to Cinque Terre and an interesting town with many delightful painted villas. We will follow the trail to Monterosso, the first village of the Cinque Terre. Along the way we’ll stop at Punta Mesco to enjoy the stunning view. Our lunch spot is by the beach where there will be plenty of time to relax. 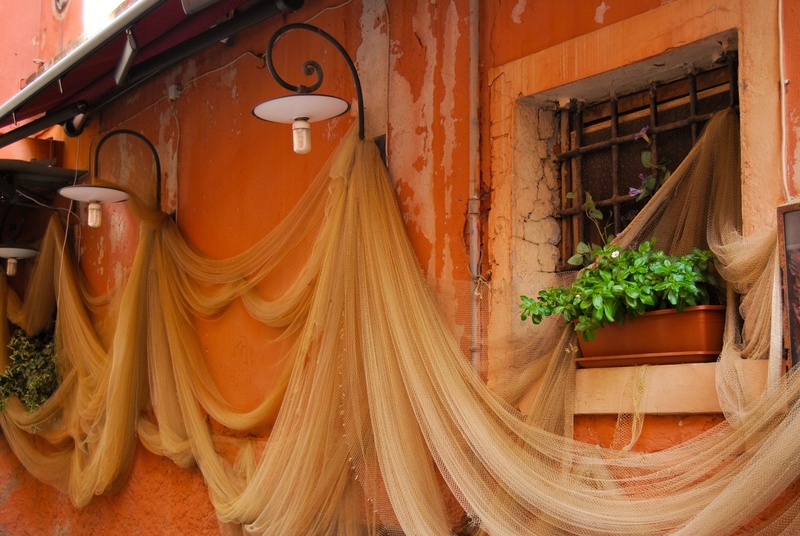 After a short train ride back to Levanto, you can spend some time strolling around the interesting historical center. A glass of Cinque Terre DOC wine is part of the protocol before a typical Ligurian dinner at one of our favorite trattorias. Monterosso is the largest of the 5 villages, and is the starting point of today’s beautiful hike that is filled with stunning scenery, including lemon orchards and lush vegetation. 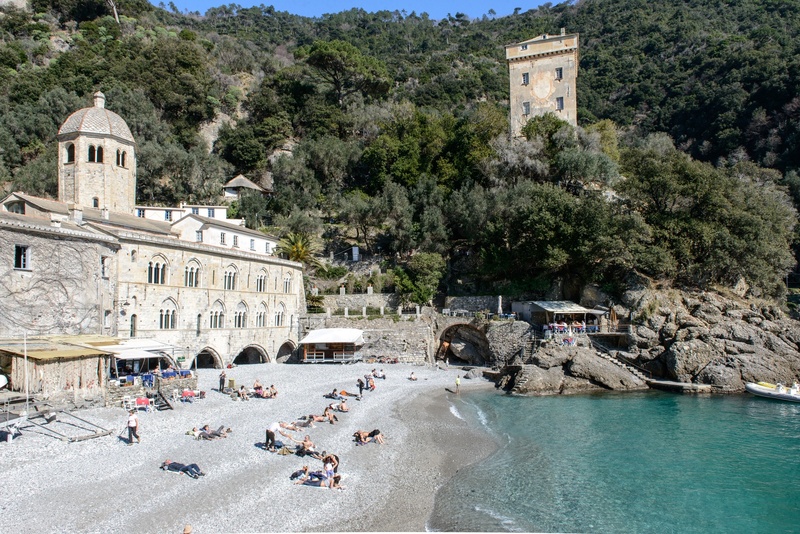 Monterosso is also known for its anchovies (Slow Food presidia) and for its tasty lemons and the two combined make one of the local mouthwatering delicacies. 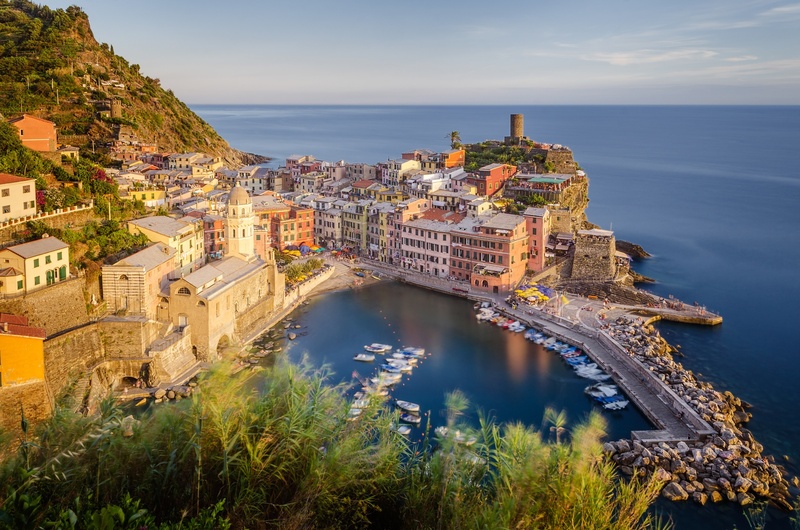 We’ll take advantage of the beautiful view by stopping for lunch on the hills, just before descending to charming and colorful harbor in the cliffside town of Vernazza. From Vernazza we'll make our way back to Levanto by boat where you'll be able to look back on the shore and see the morning’s hike from a new perspective. Tourissimo takes you off of the beaten path today with a hike that affords breathtaking views. Starting in Riomaggiore, we’ll make our way up to the Santuario di Montenero where you can take in all five villages at once! From there we’ll keep climbing (up a stairway of about 2000 steps!) to Campiglia. Campiglia is nestled across the Cinque Terre sea and the Gulf of La Spezia and on clear day you can see the island of Corsica and the Ligurian Alps. Back in Portovenere, we’ll have a wine tasting with an explanation of the very unique local production by a local wine maker. Afterwards you will be free to spend some time discovering this vibrant village where its narrow streets often lead to fantastic views of vineyards, on one side, and of the sea, on the other. Our last hike starts in Campiglia and reaches Portovenere, the southernmost village on the peninsula. 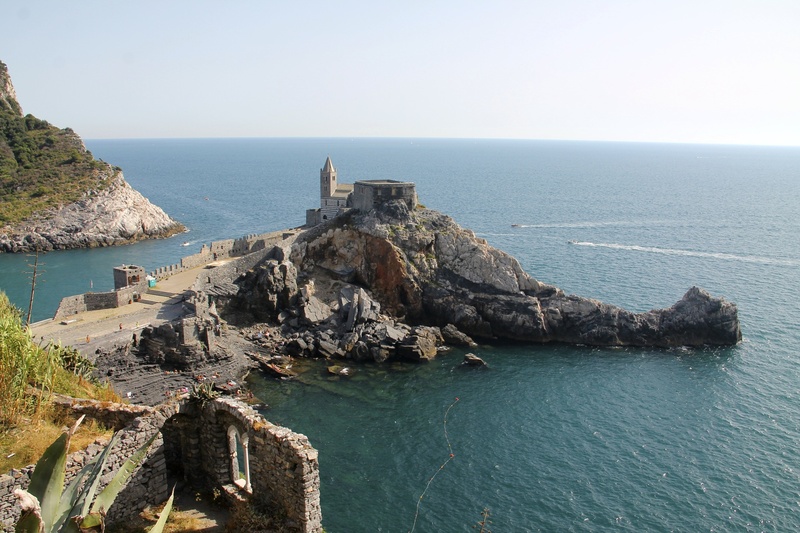 Portovenere is a beautiful and lively village with an impressive fortress that faces out to sea. We’ll discover its port and the Church of St. Peter during a stunning descent before reaching our hotel again. Our celebration dinner is at the hotel’s restaurant with a fantastic, open view of the Gulf of La Spezia. After breakfast you will be transferred to the Airport or to La Spezia Train Station. Guides can help you with your travel plans to make sure you will have a safe trip home. Other transportation - Private group transfer by Tourissimo from last hotel to the airport of choice or to La Spezia train station. Recreational/Active/Athletic - Active: hikes range from 3 to 4 hrs along rolling and hilly terrain. 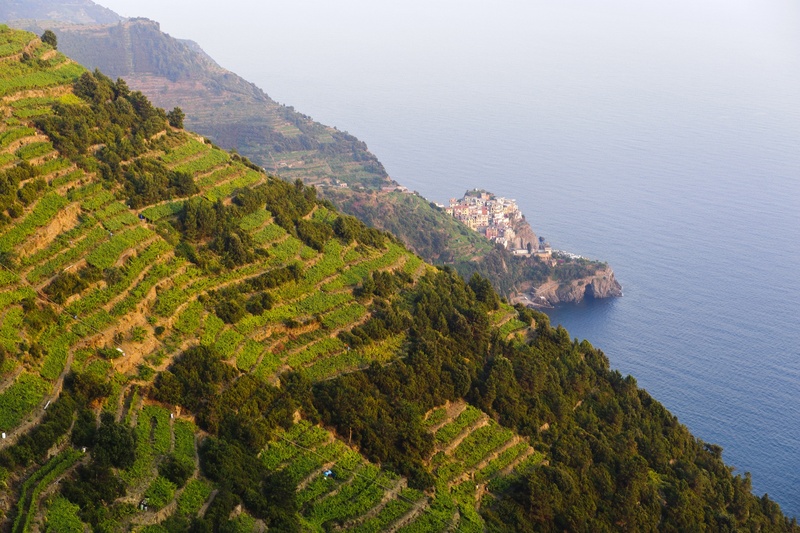 Cinque Terre boasts not only breathtaking views, but also quality food products that are linked to local land. Ligurian cuisine inherits a millenarian tradition which is tied to the history of the coastal life. In fact, today’s dishes preserve a certain authenticity than you can sense in their fragrance and flavor. Fish, as it is obvious, is very important: anchovies, bream, bass, cuttlefish, octopus and calamari are amongst the main ingredients in many dishes. Recipes are refined in a very healthy and simple way by adding aromatic herbs like oregano, thyme, and marjoram, which grow wild in the whole area, and by dressing with local olive oil (considered one of the best of Italy). Cinque Terre is famous for its salted anchovies. Anchovies are celebrated during two anchovy-centric festivals that are organized in June and September. And if you are not a fan, we dare you to try the Ligurian anchovies fixed raw with oil and lemon, flat-leaf with parsley and garlic, baked with potatoes, fried, or stuffed. 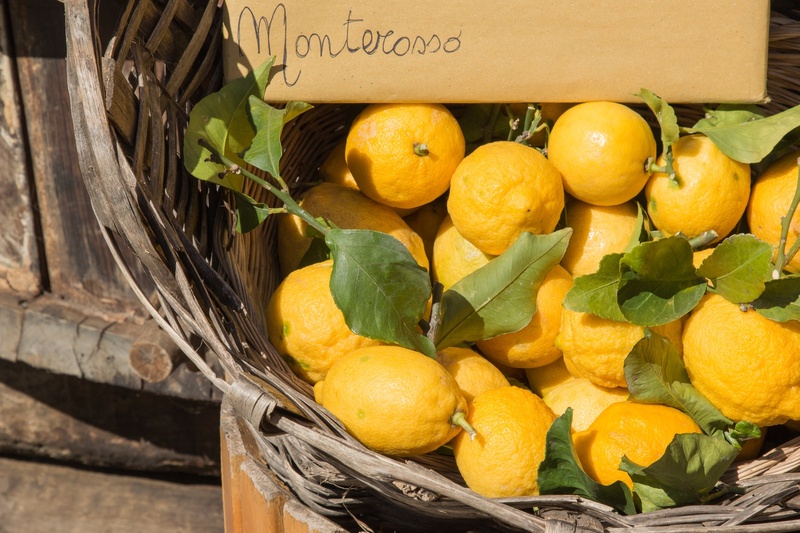 Another iconic product is the lemon of Monterosso (Slow Food presidium), which is used on fish, but also to prepare sweets and cakes and for the local nectar called “limoncino”, a sweet digestive that will spoil your palate forever. Pesto (made with the local variety of small leaf basil) and focaccia (local flatbread served with olive oil and herbs or with cheese) can be found at any trattoria and deli and they are the street foods of Liguria. Once upon a time, winemaking in Cinque Terre was one of the distinct aspects of the area, but today there are only few people who work in this sector. The production is small and it is hardly exported outside of Liguria. Cinque Terre and Sciacchetrà are the two DOC wines. The first one is a delicate white wine of a pale yellow colour, ideal with seafood dishes, or with focaccia as an aperitif. The second wine is without doubt the most well known in the Cinque Terre. Sciacchetrà is a sweet, late-harvest wine, ideal with desserts. It has a limited production and is obtained from the fermentation of the same grapes as the white wine, though in this case they are left to dry for three months on trellis. The pressing of the grapes, which takes place at the end of November, could be the reason behind the origin of its name ("sciacàa", schiacciare).